Let’s face it: the future reality for most undergraduates is scary and uncertain, especially with limited experience or practical skills up our sleeve. In classes, we always learn and learn, but how do we figure out how to apply what we learn in the real world? 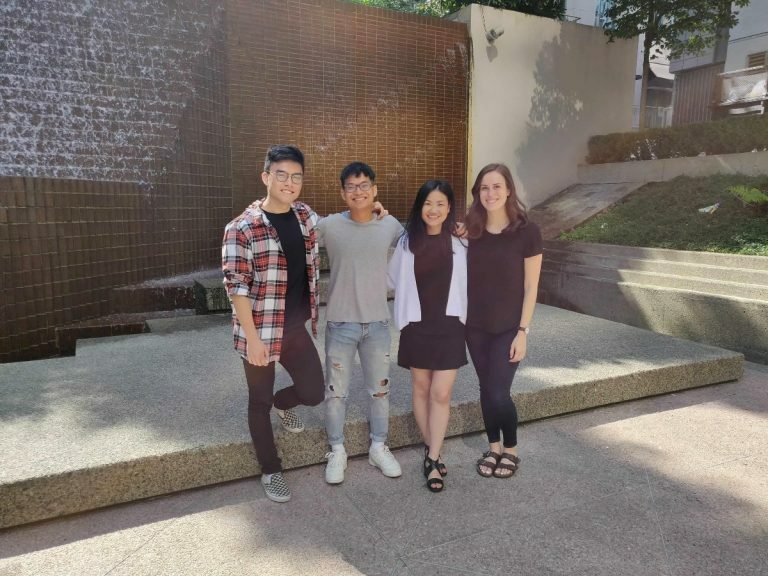 This is where SFU’s Co-op program came to save the day for 4 students who banded together to create some big things for one particular company – Pinmo powered by Evilnut Creative Technology. Even with a double major in Computing Science and Statistics, Justin is humble (as he likes to put it, but we agree). On the Evilnut side, Justin is tasked with helping build an app for one of our car sharing clients. While this experience is only Justin’s first Co-op, he has already learned so much in two and a half months, including how to collaborate effectively with a team within a fast-paced environment and overcome challenges where he doesn’t exactly know the answer at hand. For Justin, Co-op pushed him to break his own limitations and boundaries because he’s always learning something new even if he thinks he already knows what he’s learning. Before starting Co-op, Justin was keen on developing his back-end skills and experiences for his future career, but within this Co-op term, he realized that he wants to delve more into app development. For Justin, Co-op revisioned what he thought he knew he wanted to do after graduation. Fun fact: Justin is allergic to cats but has lived with them for 15 years – he just likes to test how bad his allergies can get. Born with an unparalleled charismatic passion for design, Paulo is the artist behind our graphics, landing pages, website designs, and every other visual aspect of our projects! On the Pinmo side, Paulo challenges his creative mind daily with his designs that demonstrate his original talents and abilities. This experience is Paulo’s first Co-op term. This role has strengthened Paulo’s time management and organization skills as he constantly needs to sort and prioritize his many deadlines so he can focus on what’s important first and accomplish his deadlines. Prior to Co-op, Paulo never had any real work experience (aside from his projects at school), but now he has an array of tangible skills, assets, and designs of corporate work experience to add to his portfolio. For Paulo, this experience crystallized his long-term careers goals and what he wants to do after he graduates – work in Silicon Valley as a designer. And as a plus, Co-op helps Paulo feel more responsible as an adult because now he has a sleep, work, and leisure schedule that keeps him accountable and productive. Fun fact: When Paulo was a child, he wanted to be the Pope. We’re glad he chose to be a designer with us instead. Krista is the superstar behind all our social media posts and the mastermind behind our community events. On the Pinmo side, Krista manages all the fun posts you see on our social media and organizes our internal and external events. This Co-op term is actually Krista’s third one. After her three semesters of Co-op, she realizes that her boundaries are a lot further than she thinks they are, allowing her to achieve more than she thinks she can. For Krista, she knew that learning (especially strictly theory-based learning) wasn’t going to be enough for her to enter the workforce, she needed to learn more applicable practical skills. With Co-op, Krista has grown more confident in her abilities, is more prepared for new challenges, and believes in her talents. Co-op helped Krista narrow down and solidify the field that she wants to pursue – digital marketing. Before starting even her first Co-op, Krista wasn’t sure what she wanted to pursue, but now she’s grown into this confident and strong-willed individual with a bright vision for her future. Fun fact: Krista has a passionate love and obsession for office supplies, stationery, and planners. She could spend hours (no joke) at Michael’s browsing through planners and stickers. Hi! I’m the writer behind this post you’re reading right now and also one of the Co-op students. On the Pinmo and Evilnut side, I write, edit, and post blogs, content for marketing campaigns, website content, and other written publications. In this position, I’ve also stepped outside my comfort zone and started learning how to code. While this particular Co-op position is my first one, I’m well into my second semester. As a student, I realized that I’ve done countless projects and assignments, but I’ve never really applied what I’ve learned in a real work environment. With Co-op I wanted to practice what I’ve learned in classes, challenge my abilities, make new connections, and experience what it’s like to work Monday to Friday at a 9 to 5 job – which are all things that this Co-op term at Pinmo has helped me accomplish. After my Co-op experience, I am more competent and confident in writing creatively and professionally (yes, those are contradictions, but it’s true!) and I have met some incredible people along the way that have challenged me and helped me grow in more ways than one (thanks to my managers, Hafeez and Arta). Fun fact: The sound and feeling of ripping Velcro makes me cringe as bad as nails on a chalkboard do.